Modern timber frame homes and barns offer the very best of both old and new technologies. They combine the beauty and charm of wood with energy conservation through the use of precision joinery and state-of-the-art insulation systems. Unlike many new structures today, custom timber frame homes and barns are built to last for generations. Each timber is individually cut using traditional joinery before being transported to your site, where they are then assembled and fastened together using handmade white oak pegs. Every joint in the frame is either self-locking, such as dovetailed roof purlins and floor joists, or is designed to be secured with wooden pegs. The result is a building whose structural integrity and character cannot be equaled by conventional 'stick frame' construction methods. 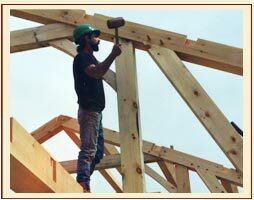 If you have plans for a timber frame structure or are interested in more information, contact Andy Buck, a third generation Mainer living above his workshop on the family farm in Naples. Meet Andy who has had twenty years of experience building custom timber frames of all sizes, for all uses, and in a variety of settings from coast to coast. When plans are finalized for your custom construction, you can be assured Andy will keep the project on time and on budget. Stop by Andy's Workshop... visitors are welcome during business hours. Take a moment to watch this video of the raising of a pedestrian bridge, the Bob Dunning Memorial Bridge, in Bridgton's Pondicherry Park which took place on September 11, 2010. Click arrow on video to begin.